Anna-Lena Nilsson is Professor of Sign Language and Interpreting Studies at Sør-Trøndelag University College, Trondheim, Norway. Her PhD-thesis was titled “Studies in Swedish Sign Language: Reference, Real Space Blending, and Interpretation.”. 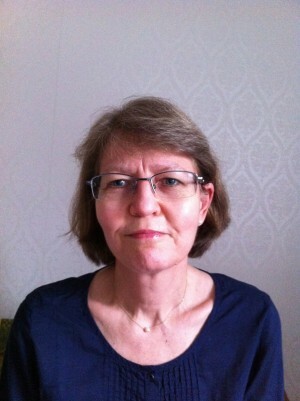 She has more than 30 years of experience of signed language interpreting, and has been responsible for a number of continuous professional development courses at Stockholm University. She was part of the team planning a BA program in Sign Language and Interpreting launched there in 2013. During 2012–2014 she held a research grant form the Swedish Research Council for the project “Use of Signing Space in Simultaneous Interpretation”. Interpreting from signed language into spoken language: The skills and knowledge needed to succeed. Most signed language interpreters are second language users of the signed language they work with. When they interpret into spoken language they are thus typically working into their first (or native) language, which from a research perspective is usually considered the easiest and safest direction. Why, then, do so many signed language interpreters consider interpreting into spoken language so difficult, and how can skills in this type of interpreting be improved? The presentation will describe where some of these perceived difficulties originate, and how they can be handled. Focus will be on the linguistic knowledge and awareness that is needed to interpret simultaneously between languages that are produced and perceived in different modalities. Describing the same situation, speakers of these two types of language will frequently focus on distinct aspects of it, and the information will be packaged in entirely different ways. What skills and knowledge do interpreters need to have then, in order to produce the best possible spoken language rendition of a signed message? Drawing upon different areas of linguistics, the presentation will describe some of the skills and knowledge needed for interpreters to manage crucial structural differences between signed and spoken languages. In addition, a number of key concerns when interpreting monologues, dialogues, and multi-party conversations will be taken into consideration. Important aspects such as when to start speaking, as well as the appropriate choice of expressions and how these choices may affect the impression a Deaf presenter makes on his/her audience will be discussed. Who else wants to support efsli 2015? Yet another Sponsor!!! 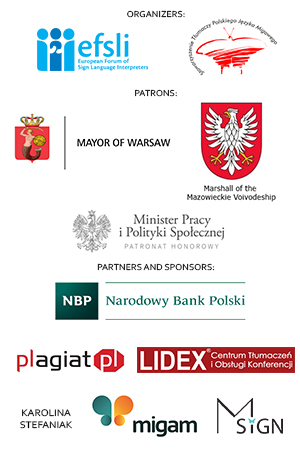 Another Sponsor for efsli 2015! How long do we have to wait for efsli2015?